Hi there! We know it’s been awhile, but we’ve continued to meet on the last Tuesday of the month in our new location at A Verb For Keeping Warm! 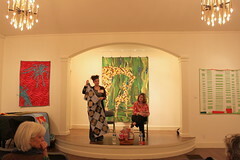 Here are the highlights of our July meeting. Stacey has once again offered her cabin up for a quilting retreat this Fall. Current available weekend dates are: Sept 14 and 24, Oct 5 and 19th. The cabin can accommodate about 8 sewists. If you are a member of EBMQG and want to join, please let her know by either leaving a comment here or on the google group thread on which dates are good for you. She will schedule a weekend that hopefully accommodates the most people. 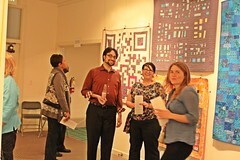 Our third annual quilt show, Stitch Modern, takes place in February. 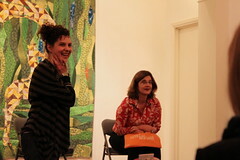 Birgit is in the process of finalizing the dates with the Piedmont Center of the Arts. Please think about what you would like to enter! 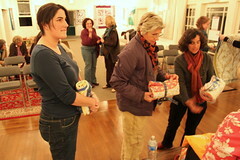 Anyone who has attended at least two meetings is eligible to enter a quilt. Please note that we don’t meet in December and typically set up the show during our January meeting. We will likely have requests for submissions in October/ November. Please stay tuned! 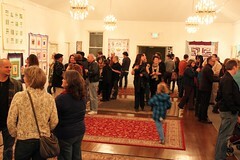 Piedmont Center for the Arts is holding another quilt show, Interpreted Inspiration, the weekend of August 16-18th. 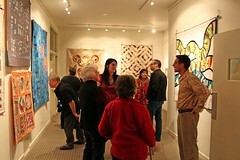 They also have a call for artist submissions for the upcoming juried show, Return to Simplicity. 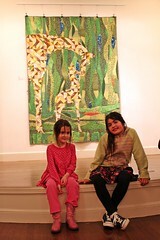 We would love to see a quilt in the show! Deadline for submission is September 2nd! Tara has a quilt pattern scheduled to be published in the Interweave magazine. She is also working with someone to publish another quilt pattern to sell. Congrats! 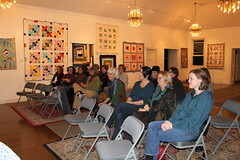 East Bay Heritage Quilters continues to welcome us to their modern meet ups! Margaret holds onto our EBMQG library, please let her know if you’d like to borrow a book. Lots of recommendations for Leah Day’s website for help with free motion quilting. 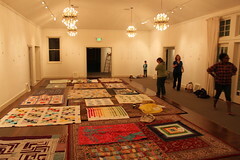 Also check out her blog, The Free Motion Quilting Project. 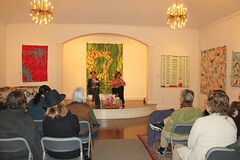 Empty Spools Seminars also came highly recommended! We look forward to seeing you at our next meeting on August 27th! I’d like to come to your Quilters Meeting on August 27th. Can you tell me what time it is? And confirm the location (still at A Verb for Keeping Warm)? Yes! Our next meeting will be at the store, A Verb for Keeping Warm, starting at 6:30pm on Aug 27th. I hope to see you there!